"I looked over and said, 'Do I see a cat?' We've got to save that cat." They perhaps are better known for chugalugging six-packs of cheap American beer and hurling disgusting catcalls in the direction of pretty young girls in short skirts, but underneath all the bluster, brawn, and accumulated dirt and grim that construction workers wear of the outside there beats a few kind hearts that are made of pure gold. It is to one such group of these extremely hardworking men that a black and white kitten named Chabot-Matrix in Norway, Maine, owes his life. "I looked over and said, 'Do I see a cat'?" Paul Champagne of Chabot Construction Company in nearby Greene later recalled for the benefit of the Sun Journal of Lewiston on January 3rd. (See "Kitten Cries Bring Construction Workers to the Rescue.") "We've got to save that cat." That was on December 30th and Champagne was perched high atop a sixty-foot crane working on the Opera House. 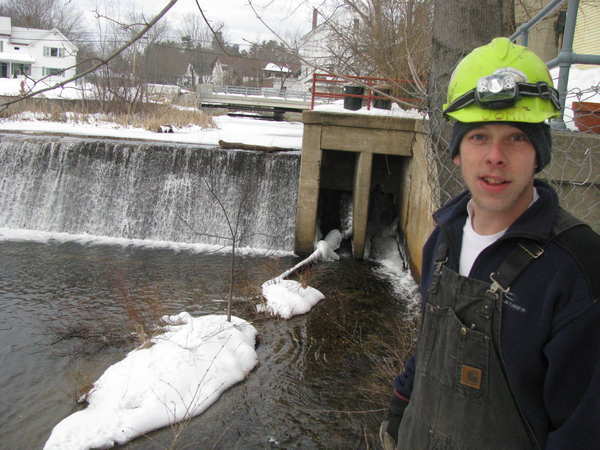 The kitten was stranded down below on an ice floe in the Pennesseewassee Stream just off of Main Street. Obviously in distress, Chabot-Matrix was pacing up and down in panic and crying for help. Champagne's boss, Tom Kelsey, first considered using the crane in order to mount a rescue but on second thought elected instead to have John Schnopps wade in after him. "Just get him!" he told Schnopps. Forever thankful that the cavalry had arrived, no matter how tardy, Chabot-Matrix did not offer any resistance and Schnopps was able to successfully bring him ashore. It is not known how long Chabot-Matrix was exposed or how he wound up on the ice floe in the first place. Since it is extremely unlikely that he swam out into the icy water on his own volition, there is a good chance that he was thrown into the stream by his previous owner. That is precisely what happened to a calico cat named Lucky in late December of 2005 when she was hurled into the Clark Ford River in Missoula, Montana. In her case, however, there was not any doubt that her owner wanted to drown her because she had been locked in a cage that was weighted down with a sixteen-pound stone. It also is revealing that both Chabot-Matrix and Lucky were abandoned between Christmas and New Year's Day. Too ashamed to commit their dastardly deeds during the period of the year that Christians hold to be the most sacred, their abusers obviously felt relieved of all such inhibitions with the dawning of Boxing Day. Unlike River, Chabot-Matrix appears to have come through his close encounter with the Grim Reaper unscathed in that he did not even require veterinary treatment. The outcome would have been entirely different if the construction workers had not intervened because sooner or later he surely would have succumbed to either hypothermia or starvation. Although he, understandably, wanted to remain with his rescuers, Chabot-Matrix was given to Chris Ryan who operates a beauty parlor at 426 Main Street. Since she uses Matrix hair products, she added that suffix to the appellation already given him by his rescuers. He now has joined the two other kittens and a Beagle that reside at her house. "I want to keep him," she told the Sun Journal in the article cited supra. Nevertheless, she is prepared to relinquish possession of him under certain circumstances in the unlikely event that his previous owner should want him back. "I want to make sure they take care of it (sic)," she added. Toward that end, she plans on having Chabot-Matrix sterilized and vaccinated. 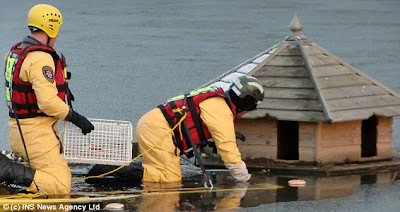 Despite the derring-do exhibited by the construction workers in this case, there are definite limits as to just how far they are willing to go in order to rescue animals in extremis. "If it had been a rottweiler, we would have called the Fire Department or something," Champagne told the Sun Journal. Melting ice also can be perilous as one intrepid moggy in Fleet, Hampshire, found out last winter. 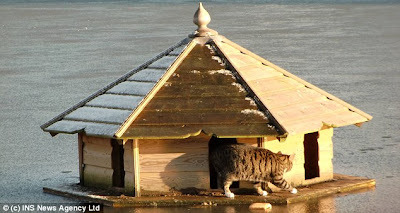 After having ventured out across frozen Turners (sic) Pond, the cat took up temporary residence in a floating duck house. Unfortunately, the ice began to melt leaving it stranded in the middle of the pond. Concerned citizens telephoned the RSPCA on January 4, 2010 which in turn inveigled the Hampshire Fire and Rescue Service into mounting a rescue. The frightened cat declined an invitation to stick around, however, and instead made a break for it. At about twenty feet from land it fell through the ultra-thin ice and thus was forced to ford the frigid water the rest of the way to shore. Back on terra firma, it quickly disappeared into a housing estate and, as far as it is known, has not been either seen or heard from since. On February 1st of this year, Natasha Schroeder was driving down Pawnee Street in Cleveland, Oklahoma, when she accidentally spied a two-month-old kitten named Blizzard buried in eight inches of snow. 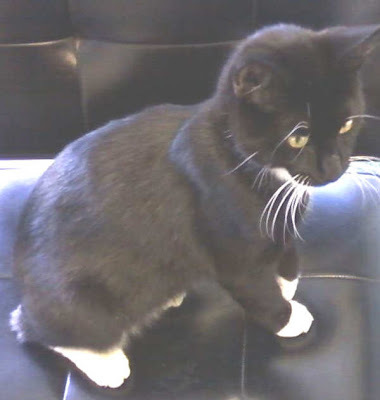 He was meowing piteously and near death due to both hypothermia and starvation. His paws were cracked and bleeding and one of his back legs had sustained an unspecified injury. "It was shaking uncontrollably," Schroeder later told KJRH-TV of Tulsa on February 2nd. (See "Woman Finds Kitten Freezing in the Snow after Being Dumped in Cleveland, Oklahoma.") "He could barely hold his head up." Schroeder draped Blizzard in a blanket and rushed him to Pound Pals where Lee Merrifield put a towel around him and placed him in a pet carrier. Amazingly, he revived on his own and soon was able to eat and walk again. "This cat was just dying out there," Merrifield told KJRH-TV in the article cited supra. In fact, it is a miracle that he did not die considering the minimalist care that he received from her. In addition to being denied the topnotch life-saving veterinary care that he deserved, it appears that Blizzard purposefully was dumped alongside the street so that he would be killed either by the elements or a motorist. Not surprisingly, no arrests have been made in this horrific case of animal cruelty and it is doubtful that the authorities in Cleveland are even bothering to investigate it. 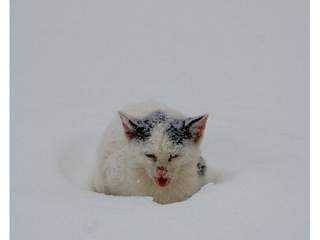 Crimes are committed against cats year-round but those perpetrated during the winter are all the more egregious. For instance, a two-year-old brownish-gray cat named Roo was run down and left for dead by a hit-and-run motorist on February 16, 2007 in Lower Windsor Township, Pennsylvania. In November of 2008, an unknown assailant who is still at large shaved away the fur from the sides, head, tail, and stomach of a twelve-week-old orange kitten named Chopper in Chatham-Kent, Ontario. Already half-starved to death as well as plagued by a cold, fleas, worms, and ear mites, Chopper was left out in the cold to die. In addition to deliberate acts of cruelty, even the salt that is spread on streets in order to melt snow and ice can be deadly to cats. For example, a two-year-old cat named Mylo from the Mitcham section of the borough of Merton in south London died in January after eating gritting salt. Moreover, salt toxicity is an especially odious way of dying. The salt shrinks a cat's brain which in turn causes the blood vessels to rupture. The end result of this can be either permanent brain damage or death. Cats suffering from salt toxicity become dehydrated, lethargic, and non-responsive before they finally collapse. Seizures also are common. That is precisely what happened to Mylo. "He was quite sleepy for a couple of days and kept himself to himself, whereas he usually liked to jump up for a cuddle," his owner, Selina Jones, related to the Wimbledon Guardian of Cheam in Surrey on January 14th. (See "Mitcham Pet Cat Dies after Eating Gritting Salt.") "But we didn't realize anything was seriously wrong until he jumped off the bed and collapsed." Mylo was rushed to the Blue Cross animal hospital in Victoria (City of Westminster) but by that time it was too late in order to save him. Worst still, he was far from being the only cat in London to have died from salt toxicity this winter. "In the cases we saw last month (December), the animals were very close to death by the time we treated them," Kathryn Taylor, a veterinarian with Blue Cross, told the Wimbledon Guardian. "We attempted to control the seizures with intravenous fluids to get rid of the salts and treated them with diazepam but unfortunately the cases were too extreme and the cat (sic) has sadly died." The good news, if it may be called that, is that cats must lick up quite a bit of salt in order to become sick. If at all possible, cats should not be allowed in or near streets under any circumstances because, in addition to salt toxicity, too many motorists get their perverted kicks by running them down. Chemicals applied to snow-covered streets pose another danger to cats and other animals but little is known about the extent of this problem. The indiscriminate dumping of snow and ice that has been treated with salt and other chemicals into rivers and other streams, such as is routinely done in New Jersey, not only pollutes the water but endangers aquatic life as well. Statistics are not compiled on this matter, but most likely thousands of cats either freeze or starve to death in Europe and America each winter. Worst still, because of all the ice that is melting at the Arctic Circle and in Greenland winters are likely to get both colder and snowier in the North Atlantic region until all the ice melts. As with everything else in this world, the animals and the poor always bear the brunt of inclement weather. "Many human beings say that they enjoy the winter, but what they really enjoy is feeling proof against it," Richard Adams observed in his 1972 novel, Watership Down. "For them there is no winter food problem. They have fires and warm clothes. The winter cannot hurt them and therefore increases their sense of cleverness and security. For birds and animals, as for poor men, winter is another matter." Photos: Chris Ryan (Chabot-Matrix), Leslie H. Dixon of the Sun Journal (paw prints in the snow and Schnopps), Daily Mail (Duck house cat and firemen), and Natasha Schroeder (Blizzard).